The cracked flange seems like a fairly common internal injury. This is what my 2N looked like when I pulled the top cover. I believe this is caused by aggressively backing an implement into or over something that jams the upper lift arms higher than they are supposed to go. Most of the external 3 point parts on my 2N were not original to that tractor. The paint layers I removed were very different from other parts. I "fixed" mine by rebuilding part of the flange with a glop of JB Weld. Just enough to create about 1/4" of contact area for the gasket. It turned out better than I thought it might. The hole that exposes the ring gear is on all of them. 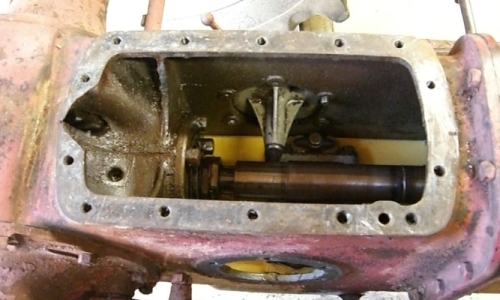 That hole may be clearance and/or to allow the ring gear to throw fluid into the upper pump area.